Can a landscape have too many fragrant plants? I, for one, don’t think so! Breathing in the flower-scented air of your own backyard never fails to thrill, and I still have powerful memories of the lilies of the valley in my grandmother’s backyard. Nowadays, I rely a lot on shrubs for fragrance, since many bloom longer than their herbaceous counterparts. Here are some favorites you can try in your garden to start making your own fragrant memories. It would be silly to start with anything other than the queen of fragrant flowering shrubs. The Bloomerang series (Bloomerang Purple, Bloomerang Dark Purple, and coming in 2016, Bloomerang Pink Perfume) of reblooming lilacs gives you more of what you love: flowers. 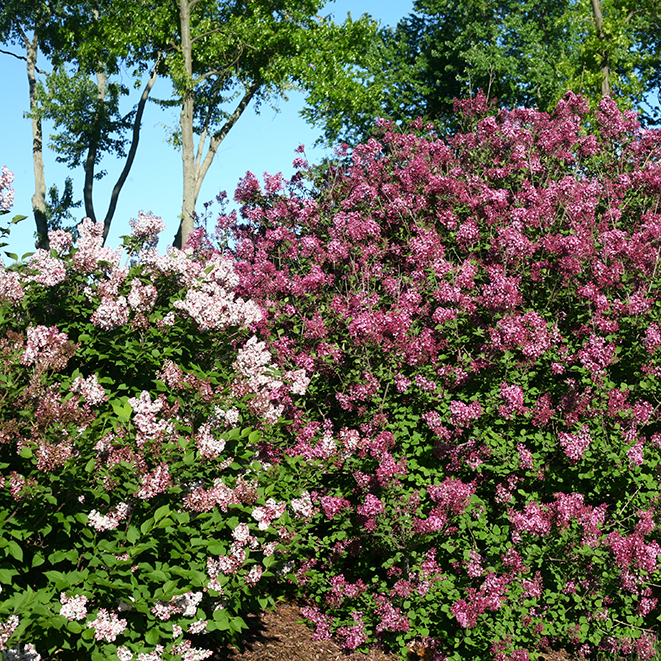 These lilacs bloom in spring, take a brief rest, and then start to bloom again in mid-summer. The show continues through frost (we’ve had Bloomerang in flower on Thanksgiving in our trial gardens some years!). These super-hardy plants shrug off tough winters, so they’re a great choice for cold climate landscapes. Hardy to USDA zone 3. 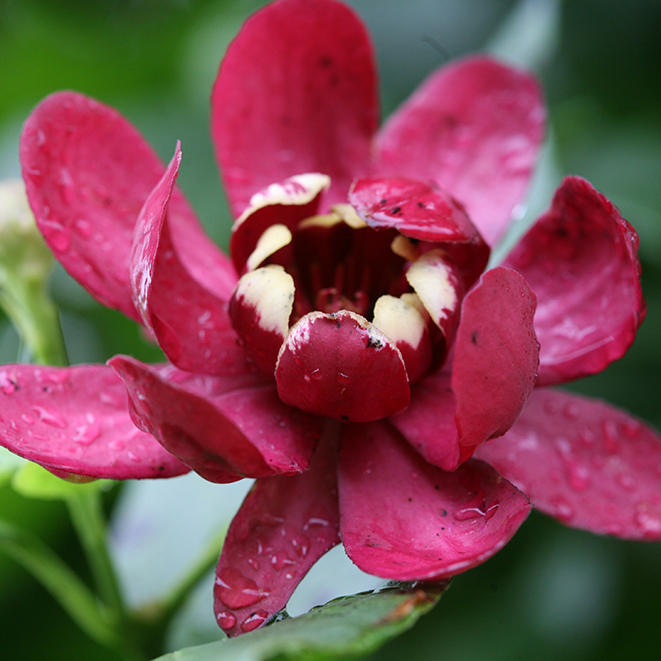 With a passel of common names like Carolina allspice, sweetshrub, strawberry shrub, pineapple shrub, and sweet Betsy, there’s clearly something fragrant about this plant. This is a large shrub (6’/1.8m tall and wide) with attractive glossy foliage and unique dark red flowers from late spring through summer. Their fragrance varies depending on the age of the flower and the time of day and even the person smelling them – to me they smell like apple cider, but I’ve heard bananas, pineapple, and even bubble gum. You’ll just have to sniff one and see what they smell like to you! Hardy to USDA zone 5. 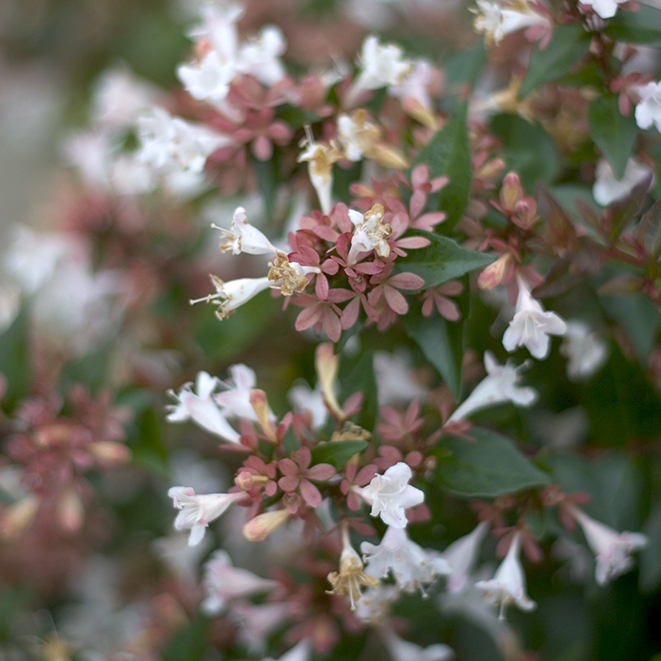 Ruby Anniversary abelia brings a jasmine-like perfume to your landscape in late summer/early autumn when few other fragrant plants are blooming. It has an elegant, fountain-like habit, glossy leaves, and red stems and new growth. The best part? Ruby Anniversary is hardy to USDA zone 5, greatly expanding the range where this very long-blooming shrub will grow. This easy-going native shrub blooms in mid-summer – all the better to enjoy its sweet-spicy scent wafting on the warm July breeze. Vanilla Spice® and Sugartina® ‘Crystalina’ were selected for exceptional fragrance, large flowers, and clear yellow fall color. A good choice for partial shade. Hardy to USDA zone 4. A garden classic that’s still going strong. 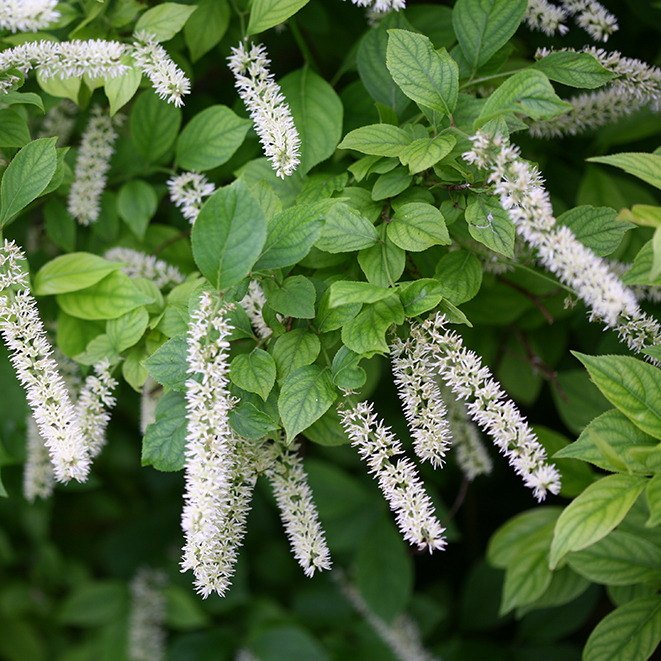 Little Henry itea has been beloved by gardeners for 15 years for its compact size, handsome shiny leaves, and sweetly scented flowers in early summer. This shade-tolerant native shrub also offers outstanding fall color, so its appeal lasts well beyond its bloom time. Hardy to USDA zone 5. The best thing about fragrant vines is they create their flowers where it matters most – at nose-level. Plant exceptionally fragrant ‘Scentsation’ honeysuckle at the base of a pretty trellis, pergola, or even an unused basketball hoop pole (which is where mine is planted!) 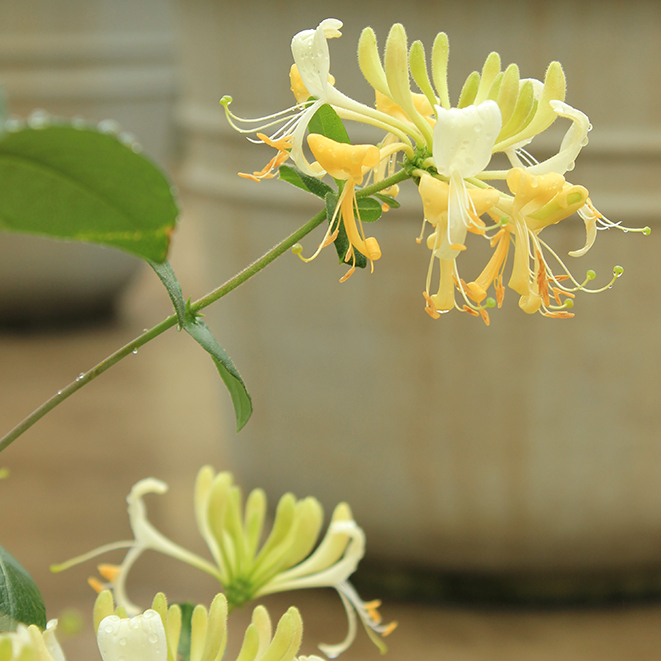 and let this non-invasive vining honeysuckle cast its spell over your garden. Hundreds of fruity-sweet yellow and white blooms appear from late spring through mid-summer, so you’ll enjoy the delicious scent for a very long time. Hardy to USDA zone 4. When it comes to fragrance in the garden, elderberries are an interesting case. Their foliage smells notoriously funky (Take, for example, Monty Python’s famous “your father smelt of elderberries!”) but the flowers give off a delightful sweet and soft anise scent. That’s why, throughout Europe, the flowers are added to pitchers of cold water as a refreshing summer beverage, infusing it with their perfume (here’s a recipe if you need one: http://allrecipes.co.uk/recipe/23894/sparkling-elderflower-drink.aspx). 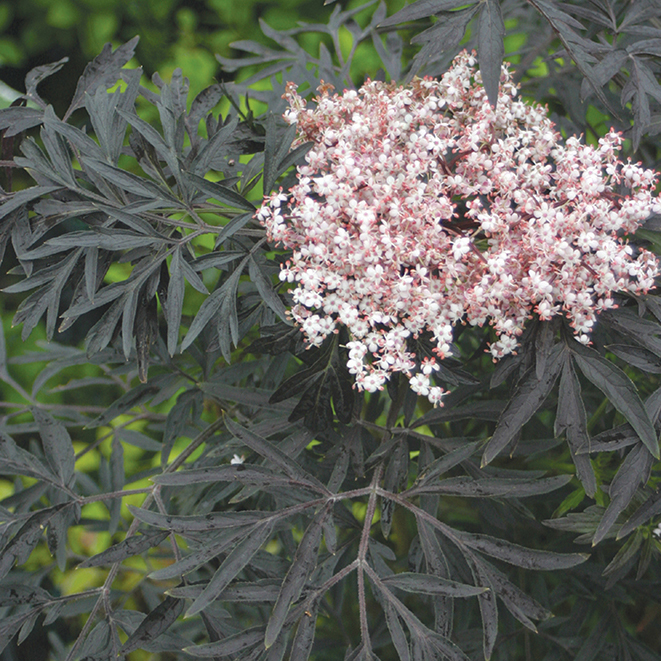 Black Lace and Black Beauty elderberries tint elderflower water pink because of their natural purple pigmentation. Hardy to USDA zone 4. Lilacs get all the credit for springtime fragrance, but those who grow Koreanspice viburnum know that it deserves wider recognition: this early spring blooming viburnum has a powerful spicy-sweet scent that’s unlike anything else. 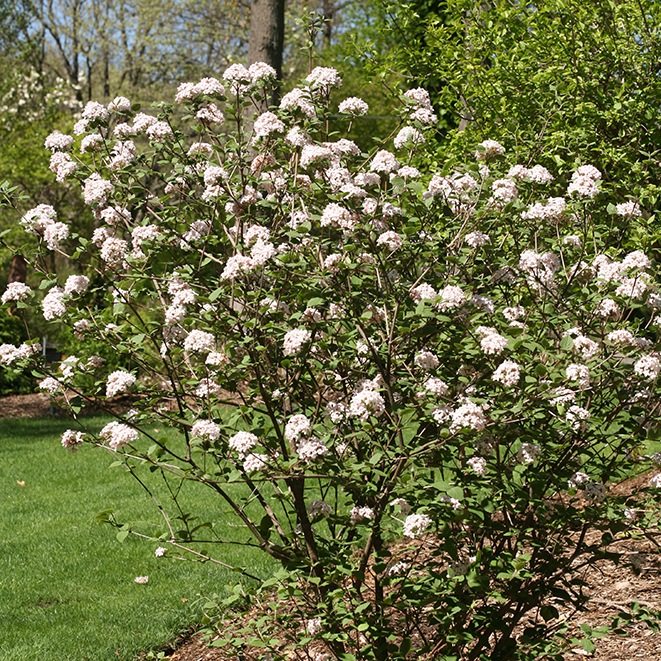 Spice Girl viburnum offers dozens of pink flowers; Spice Baby is a dwarf variety that’s great for small space landscapes. Handsome foliage carries this plant through the rest of the season. Hardy to USDA zone 4. Grow your own bay leaves! This popular herb is also a gorgeous landscape plant. 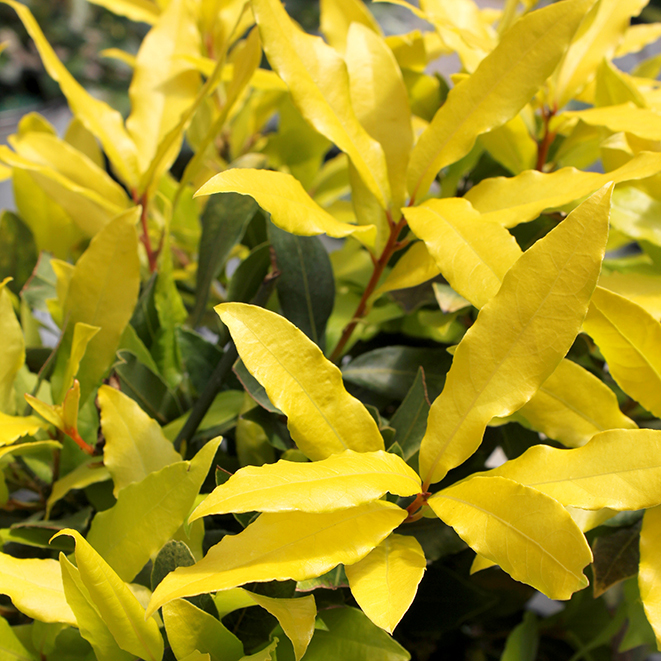 Sicilian Sunshine bay laurel ups the game with bright yellow foliage. You can use its aromatic leaves in your cooking either fresh or dried; they’re also nice in floral arrangements or perhaps as a laurel crown to honor someone on their birthday or graduation. Though bay laurel can only grow outdoors in USDA zones 8-10, cold climate gardeners can grow it in a pot and bring it indoors onto a sunny windowsill for winter. Irresistibly unique flowers emit an irresistible honey fragrance! 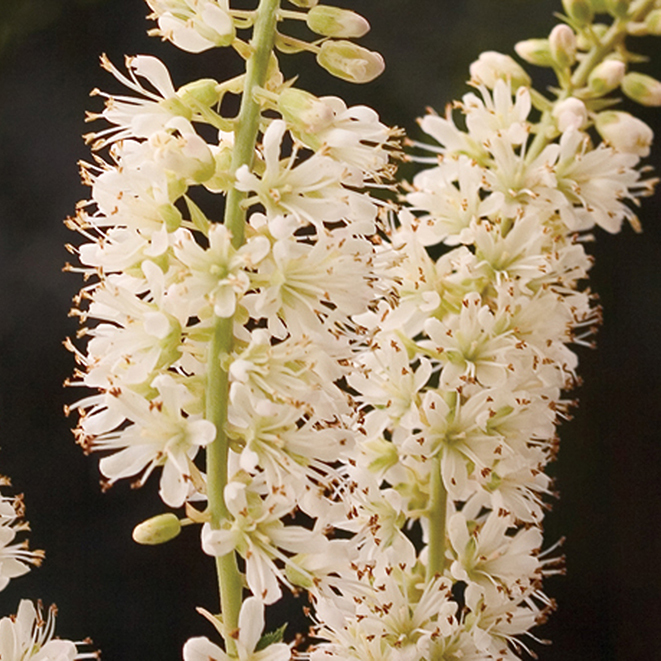 This native shrub is covered with hundreds of white globe-like blooms in mid-summer. Sugar Shack buttonbush is smaller than the wild forms, so it’s suitable for most any landscape. After the flowers fade, the fruit turns red to prolong the show into autumn. Hardy to USDA zone 4. For more information, go to provenwinners.com.